It’s that time of the year again that you see hearts and teddy bears all around! So today we want to share with you a quick and simple Valentine’s day card. 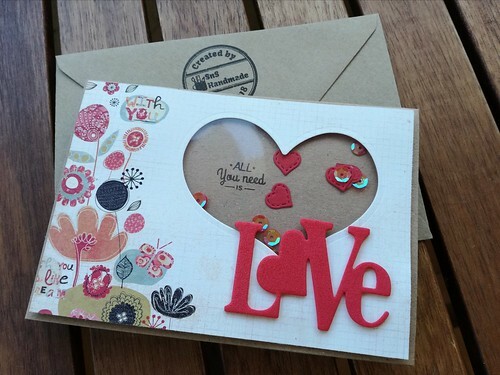 The focal point of this card is this beautiful big LOVE die that we cut out of red craft foam. We decided to go for a shaker card and to keep the rest pretty simple. First we created the panel out of a beautiful cardstock that we had in our stash for a long time. To cut out the window we used a heart die with faux stitching all around. We covered the window with an acetate and we stamped on the card front the “all you need is…” sentiment. For shaking material we sprinkled some clear sequences and a few tiny red hearts that we had left from a previous project. The final step was to pop the entire panel on some foam adhesive. And the card is ready! What do you think? It’s a pretty basic shaker card but we love how it turned out! Thank you all for stopping by! See you soon on our next post!Until then…happy crafting! Next PostOne stamp five cards!